Our autumn 2014 grant from the Premier League and the FA Facilities Fund has helped to make our 'First-Class Football Facilities' dream become a reality. Our fantastic outdoor 3G artficial turf football pitch was opened in January 2015 and benefits the whole East Hertfordshire community. (photo above: just after the pitch 'Opening' ceremony). a FIFA RECOMMENDED ONE STAR and FA APPROVED facility. Our new outdoor 3G artficial turf football pitch has enabled us to work creatively with the Herts FA, local football clubs and local sports networks to promote and encourage participation in grassroots football within East Hertfordshire. We also have an exciting and evolving Wodson Park ‘Football Development Plan’ to provide further opportunities for local football. Local football clubs are helping us to deliver and grow our ‘Football Development Plan’, via their enthusiastic support as active ‘Partner Club’ members of our Wodson Park Sports and Leisure Centre ‘User Group Partnership’. 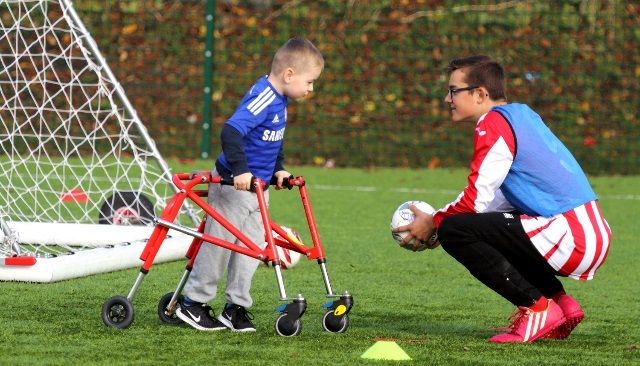 Since our outdoor 3G artficial turf football pitch opened in January 2015, we have ensured that our facilities are available to support a wide variety of local community users. ~ Herts 6’s : Thursday evenings (19.00 -21.00) small-sided adult football league. Our 3G Artificial Turf football pitch looks like natural grass and has similar playing characteristics – it provides a firm grip and good ball control. However, if you wear the ‘wrong’ footwear you could injure yourself and/or damage the playing surface. Please see our ‘Acceptable Footwear’ guide below. 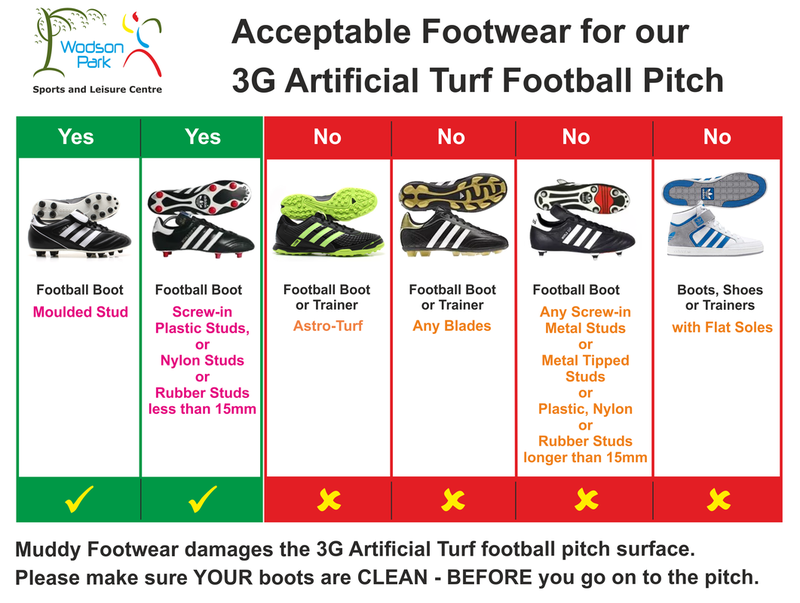 ​It is the 3G Artificial Turf football pitch Hirer’s responsibility to physically check the footwear of ALL users before they go onto the pitch. If a member of Wodson Park Sports & Leisure Centre’s staff sees anybody wearing incorrect footwear on our 3G Artificial Turf football pitch, they will bring it to the Hirer’s attention and advise them of the 3G Artificial football pitch booking Terms & Conditions. Wodson Park Sports & Leisure Centre reserves the right to exclude any user from our 3G Artificial Turf football pitch. ~ four 5-a-side Football pitches. or please contact Wodson Park Reception.